One of Dayo Dental’s clients visiting a dentist in Los Algodones. Start your New Year’s Dental Goals by visiting your dentist. Forget resolutions. They never work. Once you break them, it’s over. Then guilt and back to old habits. How about changing resolutions to goals. The good part about goals is that you can always start over the next day if you failed today. And, you have all year to achieve them. You can even schedule goals one at a time. It’s way more manageable. Here are sample dental goals from the Dayo team in preparation for 2013. Between morning coffee, gummy bear snacks, and the onions in your Philly cheese steak, your mouth would have already been a mess after lunch. Bring a toothbrush to work and brush after lunch when you get back in the office. While everyone else is asking each other if they have mints during that afternoon meeting, you would have already renewed your mantra and giving everyone a glowing smile. Your boss at the end of the meeting table thinks you’re a winner. Forget mints, brush your teeth. Even since you were in your 20’s, your gum specialist has pointed out that your gums are receding. Ten, twenty years after, it looks bad. You were shocked one day when you were poking in your mouth that one tooth is loose. It’s never too late to prevent further gum recession (and save your teeth). Let’s say you are a real estate agent, but you like kickboxing on the side. One day your friend gives you a hard one and chips your front tooth. Would you rather lose a $10,000 commission for a tooth bonding procedure that cost less than a $100 in Mexico? Keep up with your dental esthetics as much as your keep up with your profession. It’ll pay dividends every day. 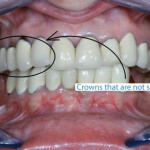 Yes, as your dentist advised, that molar could eventually break if you don’t put a dental cap (crown) on it. Maybe you never got around to it after seeing an Endodontist. Or, maybe you just ran out of funds. 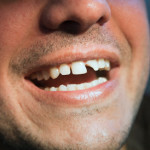 Unfortunately, if that tooth breaks at the gum line or in the root structure, you may have to get that tooth extracted. You’ll get stuck with a more expensive option such as a dental bridge or tooth implant. All it takes is one hard bite on that tooth, then it’s panic time. Hop on the car, drive to the Mexico border and get a tooth cap in Mexico. You get cheaper crowns just right across the Mexico border. Don’t wait too long. Missing a tooth? Due to the down economy, many of us postponed major dental work such as dental implants. In your case, you opted just to do the tooth extraction due to the high cost of dental tooth replacement in the US or Canada. Fortunately, you have the option of travelling to Mexico for affordable dental implants. By saving just $100 a month, you’ll have enough to start the work by the summer (the first stage is the installation of the dental post). The dental cost of a dental implant post in Mexico is approximately $800. It’s time to invest in yourself, invest in dental implants. Top Dental Goal #6: Get your wisdom teeth extracted. Ah, the fear of dentists. Trust me, we all have it at one point. For me, I got it from that childhood fear of dentists. Little by little, you wisdom teeth could be damaging your mouth. Some people have their wisdom teeth pushing the rest of their teeth resulting in a crooked bite. Some people are enduring dental pain hoping that one day that wisdom tooth will fall off by itself. I got my wisdom teeth extracted a few years ago in Los Algodones, Mexico. My oral surgeon in Algodones did such a great job, I barely felt any pain. Not only did I get rid of my wisdom teeth, I finally left behind my childhood fear of dentists at the border in Mexico for good. Cold water, slight pain. Chewing, slight pain. Brushing, slight pain. But you are tough, a little tooth pain is nothing. You can always chew on the other side of the mouth. Until it becomes real pain. That’s when it might be too late. 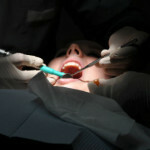 Your old filling becomes a root canal treatment, or even worse, an extraction. Implant supported dentures make a big difference. It’s been so many years dealing with the frustration of wearing removable dentures. You were reminded this holiday as you threaded carefully on all that turkey, ham, and even that salad with half cooked potatoes. Finally, it culminated when you had an almost embarrassing denture falling off accident at the neighbor’s Christmas party. You’ve had it. It’s time for a life changing goal. It’s time to replace those false teeth with permanent dentures secured with implants. In the past, you’ve always dismissed it as impossible after getting quoted $30,000 to $50,000 for a full set of top and bottom overdenture supported by implants in the US or Canada. You’ll be surprised that it’s really doable to save for this dental procedure by going to Mexico, where implant dentures cost just a fraction of what you were quoted locally. Start the year by calling Dayo for a price estimate for implant retained dentures. Then you set a realistic goal and start saving in 2013. Once you find out the price, maybe you already have the funds to get them now. All your life, you’ve always wanted to fix your smile with dental braces. Unfortunately, you just hate the idea of wearing braces for a couple of years. Your Orthodontist also told you that you are not a candidate for expensive invisaligns. One of our staff felt the same way two years ago. Now, he will finish with his braces in 2013. According to him, “two years of wearing braces weren’t that bad, especially once you see your crooked teeth improve over time.” Eventually, you’ll get used to wearing braces after a few months. If you are worried about the look, try clear braces. The first time our staff wore them, he said people didn’t even notice the clear braces until he brought it up. If spending in your health is the last of our financial priorities for 2013, then at least invest a couple of bucks on some dental floss. It works wonders. It could save you from tartar, tooth caries, periodontal disease, tooth loss, bad breath, etc. Unfortunately, many of us were not given this health habit at a young age by our parents. It’s a good one to add to your New Year’s Health Goals. As you begin 2013, don’t forget to work on your smile. After all, it’s the first thing people will notice when the ball drops. Grin wide, it’s the New Year!